The Bend Bulletin’s weekly hunting & fishing guide. Forty million years ago, Clarno was a lush rainforest. Remnants of this distant past can still be seen in this much drier place.Â The Clarno Unit is located 18 miles west of the town of Fossil. The Palisades are the most prominent landform. 44 million years ago a series of volcanic mudflows, swept up and perserved a diverse assortment of plants and animals that inhabited a near-tropical forest. Tiny four-toed horses, huge rhino-like brontotheres, crocodilians, and meat-eating creodonts that once roamed ancient jungles are now found in the rocks of the Clarno Unit, as well as an incredibly diverse range of plant life. Leaves, fruits, nuts, seeds, and petrified wood from 173 species of trees, vines, shrubs, and other plants have been found here thus far. Home to a multitude of plant fossils, the Painted Hills Unit is best known for its colorful geology.Â The yellows, golds, blacks, and reds of the Painted Hills are beautiful at all times of the day, but are best lit for photography in the late afternoon. Changing light and moisture levels can drastically affect the tones and hues visible in the hills. The Thomas Condon Paleontology Center, in the shadow of Sheep Rock, is the best place to see fossils from all three units of the monument.Â Multiple exposures of the Turtle Cove strata can be seen at the Sheep Rock Unit. This blue-green rock layer represents millions of years of volcanic ash accumulation. Surprisingly enough, the green tint is not due to copper, but rather a complex blending of the elements hydrogen, oxygen, sodium, magnesium, aluminum, silicon, potassium, calcium, iron, strontium, and barium. 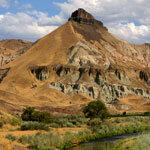 There are three separate units in the monument which are widely separated but all situated in Eastern Oregon:Â The Sheep Rock unit, the Painted Hills unit (pictured above), and the Clarno unit.Â Each unit is open during daylight hours and offer picnic areas, restrooms, information and exhibits, hiking trails, and breathtaking scenery.Â Entrance to the national monument is FREE. One of the main attractions is the Thomas Condon Paleontology Center which features a research center, a visitor center, and a world-class fossil museum. Museum hours are 9:00 am to 4:00 pm daily, but vary season-to-season, so call ahead to confirm. Another great feature is the James Cant Ranch house which includes a museum on the cultural history of the area. Both museums are located within the Sheep Rock Unit of the monument. For further information on monument hours, facilities, activities and programs, or to arrange group program, please call the visitor center staff at 541-987-2333. 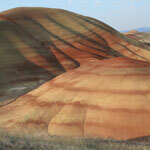 The Painted Hills Unit: Off US Route 26, 9 miles west of Mitchell, OR. Surrounded by beautiful scenery and steep canyon walls, The Deschutes rolls and tumbles as it makes its way to the Columbia River. Whether you’re a veteran river runner, or a first-timer, The Deschutes offers an unmatched whitewater experience. 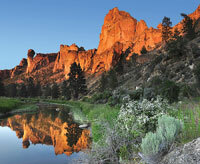 From exciting day trips to unforgettable overnight adventures, The Deschutes promises to thrill. 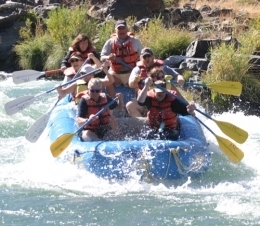 A rage of rapids, The Deschutes excites on a level of class one to four rapids. Rafters scream with delight as they splash through Box Car and Oak Springs rapids, two of the most famous plunges on The Deschutes River. 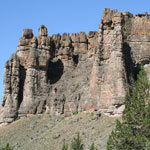 If you enjoy scenic views of deep river canyons or rock climbing, Simth Rock State Park is the place for you.Â There are several thousand climbs in the park.Â More than a thousand are bolted routes.Â We also offer miles of hiking and mountain biking trails.Â Along your trip the the canyon, you might see golden eagles, prarie falcons, mule deer, river otter and beaver. Note: Open fires prohibited at all times. There is a designated place for cooking with propane and white gas stoves. Cooking is not allowed anywhere else in the park. Gas lanterns are also prohibited. Smoking is only allowed in vehicles. If you’re looking for a classic Oregon Cascades waterfall, you’ll find it just a short drive west from Sisters. The McKenzie River roars and plunges over Sahalie Falls in a white torrent, then twists down a rocky canyon before leaping again off the cliffs of Koosah Falls. The falls are spectacular and have been used as scenes in several movies. The falls are very accessible, with developed parking areas and a viewing platform at Sahalie that is easy to get to for just about anyone. It’s a great way to spend an afternoon with a picnic lunch. To get there drive west on Highway 20 from Sisters to the Santiam Junction. 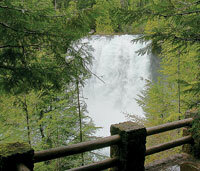 Head west on Highway 126 5.2 miles and follow the signs into the Sahalie Falls parking area.